On the other hand, it may not even be a Page, posts from Facebook Groups enjoy a lot more visibility due to a different algorithm at work. Recency – this is to do with the age of a post. Generally, the longer a story has been live the less likely it is to be seen. There will be exceptions: with personal posts, announcements of, for example, engagements, tend to stick around News Feed for longer. And for Page posts, “Story Bumping” kicks in when an older story suddenly starts to get a lot of interactions. 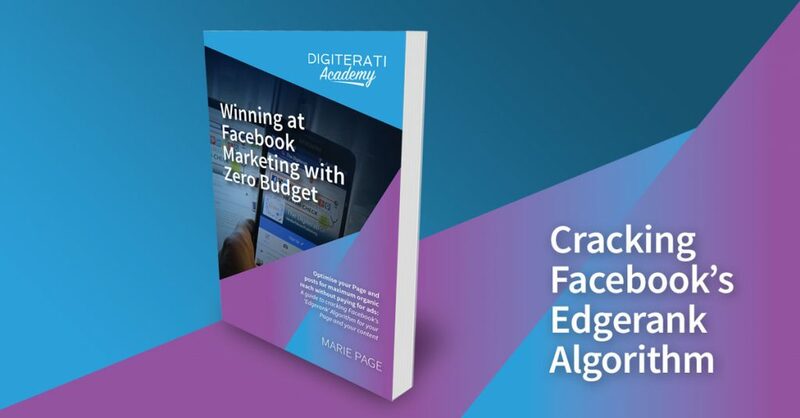 I’ve written up my research in the form of a book (you can find it on Amazon or on the Digiterati Academy website) and also in an online course one of many in our recently launched Digiterati Academy. They are packed full of examples of brands that get it right and a few clangers from brands getting it very wrong. I’ve also gone into great detail about each of the above factors and what you can do to master each of them.